Periodically my husband goes to a small town in Italy for work. I don't accompany him because the travel is longer than the stay and there are civilized rules about that (except in American business travel). Of course he returns waxing poetical about the dinner he had. Often he will call me from Italy to describe his meal in detail. He knows I am in Minnesota rethinking my travel rules. But when he is sings praises of settling down after work with a glass of wine and these hard little pretzel-cracker rings - I didn't know what to think. I am the pretzel eater in this house. I am the cracker eater. And when he found a bag of Taralli when we were in Tuscany - I finally got the point. They're addictive. It's not like eating a pretzel (which is my salt lick). It's not like today's gussied-up crackers with rosemary, cracked pepper and cheese. It's not a burst of flavor. It's simple. Understated. And when you are reaching for your fifth one - you get the point. It doesn't dazzle. It just is. No bells and whistles and although I served them with salami and cheese tonight - tomorrow Paul and I will read in the living room with a glass of wine and a small bowl of taralli and enjoy a quiet normalcy. A lovely settling in for the night. It's quite perfect for a late winter's eve. I love fancy and excitement has its place. But it's the simple and repetitive motions of putting together the taralli and then sharing them that ushers in contentment. And be warned - they do make a lot. Go to your Zen spot or freeze half the dough. 1. In a small bowl, sprinkle the yeast over the warm water. 2. In a large bowl, stir the all-purpose flour, semolina flour, fennel seeds and salt. 3. Add the yeast mixture, wine and oil. Turn dough out on a lightly floured surface and knead for about 8-10 minutes - until dough is smooth and elastic. Shape the dough into a bowl. 4. Oil a large bowel and put dough into it - turning once so all is coated. Put plastic wrap on top of bowl and let it sit to rise in a draft-free spot. Let it rise until doubled in size (about 1 hour). *Mine never did double - even after 2 hours - maybe my Minnesota kitchen is not warm enough - but the Taralli turned out fine... wonderful.... delicious. 5. Turn dough on to lightly floured surface. Divide into 8 equal pieces. Cover remaining dough as you work with one piece at a time. 6. Pinch off "grape-sized" pieces of dough. (Large grapes - not champagne grapes or you will be forming these until 2013.) Roll into a ball and then a 3-4 inch rope. Shape the dough into a ring - pinching the ends together to seal (some of mine... unsealed). Repeat. A lot. 7. Bring a large pot of water to boil. Add the dough rings - about 8 at a time and boil for one minute (they will rise to the top). Remove with a slotted spoon and let them drain. They should not touch. (They will stick together). I drained them on paper towels - but you need to remove them after about 30 seconds - or they will stick to the towels. Repeat until all are boiled. 8. Preheat oven to 350 degrees F. Arrange the Taralli on a baking sheet. Cook for about 45 minutes (until browned.) Turn off oven and let Tarelli sit in oven with door slightly ajar for about ten minutes. Transfer to wire rack and let cool completely. They will keep in an airtight container for about two weeks. And I finally see - why after taking 3 planes, renting a car and driving for two hours - making it just in time for a meeting and then a day's work - why it is so soul-satisfying to sit in a piazza with a glass of wine and some taralli - it's just so real. Nourishment in a crispy bite. Texture. It threads its way through everything. Through art, through relationships, through nature and of course through food. I think about the textures of my days - my silky ones versus my woolly ones. Texture brings vavoom to the days, doesn't it? Even though there may be days when you truly want the vavoom to stay away. It certainly makes things interesting.It's the texture that brings the vavoom to Edna Lewis's "Busy Day Cake." For Week 36 of Gourmet's Women Game-Changers in Food, I have left pasta behind and visited the rural American south. 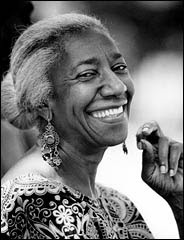 Edna Lewis is our guide and I have had a week of amazement as I researched Lewis and her accomplishments. She has drawn me into her world more than any of the web-based mega-recipe developers of recent weeks. I am glad to have been acquainted with her but now - I crave more. This is a woman/chef/cookbook author/restaurant owner who knew a lot about texture. The threads of her life reach back into rural Virginia, to New York City and into the blossoming local food movement in California. Credited with refining southern food and bringing southern cooking into its own, Edna Lewis life's and cooking was multi-facted - knobby and silky, brightly-colored and shaded in subtlety. Born in 1916 in rural Freetown, Virginia, Lewis was the grand daughter of one of the three founders of Freetown - all emancipated slaves. She credits her Aunt Jenny with her cooking skill - a skill learned on a wood-fired stove. No measuring spoons were to be had so baking powder was measured on the top of a penny, baking soda was on a nickel and salt was measured on a dime. At sixteen, Lewis left Freetown and headed up north. She was hired in a laundry and spent three hours ironing before her ironing skills left everyone unimpressed and she was dismissed. She fared better as a seamstress eventually sewing copies of Dior for Dorcas Avedon (Richard Avedon's wife). She worked for the Communist newspaper The Daily Worker and eventually married a retired merchant seaman Steve Kingston who was a communist. This was a time when being a communist put you under great scrutiny. But it was her friendship with antiques dealer John Nicholson that changed the course of her life. Together they opened a restaurant in 1948 called The Nicholson Cafe in which Lewis was the cook and part owner. Remember that this was 1948 in New York city - African-American female chefs/restaurant owners were few and far between. It became a huge success - the darling of the "bohemian set." Tennessee Williams, Truman Capote, Richard Avedon and Marlene Dietrich were frequent patrons. Her husband criticized the glittery following. "This restaurant should be for ordinary people on the street. You're catering to capitalists," he would say. Lewis remembered those admonishments and said she thought "it was such a bore." The more I read about Lewis, the more I want to know. Molly from Orangette has a beautiful post about Lewis and a soul-satisfying description of this Busy Day Cake. She calls it "Like a Lullaby." Please check out her post here. It's worth the cyber-trip. "Is it cornbread-cake?" I was asked. No, it's a white sugar cake - pure and simple - but the sugar does bring out the texture and there is a beauty of the middle soft, crumbly cake slowly stretching itself to a bit of browned, crunchy edge of sweetness. Plus you have to love a recipe that calls for 2 teaspoons of vanilla extract - that is aromatic bliss in my kitchen. Preheat oven to 375 degrees F. Grease or spray your pan. Use a stand mixer or hand-held mixers. In a large bowl mix butter and sugar until well blended. Add the eggs one at a time - mixing well between each addition. Add the extract and again - mix well. In a medium bowl combine the flour, baking powder, salt and nutmeg. Add 1/4 of the flour mixture to the butter and eggs and mix. Add about 1/4 of the milk and mix. Alternate flour and milk until all is combined well. Scrape the sides of the large bowl to get all the sugar mixture into the buttery mix. Pour the mixture in the prepared pan (I poured it directly into the center and let it spread evenly - I then had to help it a bit with a spatula and well... I still had a few waves.) Bakes 30-35 minutes until a toothpick inserted into the cake comes out clean. Molly advised tenting the top with some foil after 20 minutes so that the top did not brown (which I did). Serve alone, with whipped cream, with berries (I mixed berries with a touch of sugar), creme fraiche, sweetened mascarpone or what you will. It is indeed easy enough for a busy day - and satisfying for all days. I am wondering about adding a little lemon zest to the batter next time.... because I cannot leave well enough alone. I look forward to seeing what the other bloggers have cooked from Ms. Lewis. She has certainly sparked my mind and spirit. Please check out what the other bloggers are doing for Week 36 of Female Chef Gourmet Game Changers. And if you want to join in the fun, e-mail Mary at One Perfect Bite. Mary started this delectable journey. I made plans - very good plans. For Carnevale weekend I was going to make a tortellini pie - the sort of dish made in the Renaissance. The kind of sumptuous pie that would take three days to make. I even knew what music I would be listening to as I as I made ragu, meatballs, pastry, etc. I just never look at any dates. And when I realized on Sunday - that I was halfway done with Carnevale weekend, I knew the tortellini pie wasn't happening. I also was sated from an evening out at The Birchwood Cafe which culminated in my consuming a Tres Leches Raspberry Cake which left me sure I would not need to eat until Eater Sunday. And made me grateful that I did not have a tortellini pie to assemble. But as Sunday wore on, I did get hungry. And I started browsing blogs. Looking for small pick-me-ups. The requirements were: every ingredient needed to be in the house. Even better - the ingredients needed to fit the odds and ends of my food-stuff. And then I saw the Spaghetti Fritattas on Marie's Proud Italian Cook blog. I had bookmarked that recipe over a year-and-a-half-ago. Just as with the tortellini pie, I was running a little late. Marie made these baby fritattas with spaghetti, mozzarella, provolone, Parmesan and fresh basil. I had the spaghetti, Parmesan and provolone. Looking good. Marie mentioned that she saw them on Foodalogue's blog - so I went there. Joan's recipe also had bacon and peas. I had 3 pieces of a bacon to use up as well as an open bag of frozen peas. Looking better and better. The melty-cheese, crispy bacon, egg-coated spaghetti that went into the muffin tins reminded me of a carbonara. I used fewer eggs than Marie and Joan - I didn't really want a fritatta - I just wanted the egg to hold everything together. Next time - I will try doing this with only one egg. I put a dab of marinara sauce on them - but they didn't need it. You could also play with a dollop of pesto on them - especially if you're already incorporating basil and Parmesan. I wonder how they would do with a few toasted chopped nuts? *These are approximate measurements - this isn't a wedding cake - it's a spaghetti mixture in a muffin tin! Feel free to add or subtract ingredients - just make sure it doesn't overwhelm the spaghetti! *Or to reduce the fat - cook peas separately and add the garlic to the bacon in the last minute of cooking. If not using bacon, briefly saute the garlic. Or mix the chopped garlic into the mixture and let it cook in the oven. Whatever works for you - this is not world peace, it's spaghetti-muffins. In a large bowl, mix the cheeses together. Crumble the bacon and add it to the cheeses. Add the peas and garlic and mix. Add your spaghetti and mix well. Add the beaten eggs and carefully stir to make sure the egg coats all the spaghetti strands. Salt and pepper to taste. (I barely salted - the Parmesan takes care of that - I was generous with the pepper.) Divide mixture evenly into the muffin tins. Bake for about 20 minutes. You'd like the end of the spaghetti strands to be a wee bit browned and delicately crunchy and the egg will settle on the bottom - and be somewhat fritatta-like. Serve warm or at room temperature. (I can see how many dozens of these in a mini-muffin tin would be great for a buffet). No, it's not the spectacular Tortellini Pie worthy of a Medici. It's sort of silliness and fun - spaghetti strands pointing each and every way. Beckoning you into their secret stash of creamy cheeses and a hint of garlic. It's a party tease worthy of Carnevale and Mardi Gras. The celebration before the last 40 days or so of winter. A delectable treat before the days of tulips arrive. And the true wonder of this is - I always have a splashing of these ingredients in the house. If Uptown-son says he's coming over, I can whip them up. If Husband-on-diet is desperate for a carb, I can make these. And if a crowd of 40 people are descending upon my home for a holiday dinner - these are worthy. It's uptown-downtown, city-country, plain and fancy. Baked polenta is given some oomph with prosciutto and a little melted ooze courtesy of fontina cheese. Topped with a crispy sage piece, it dresses up polenta and goes out on the town. This is one of over a thousand recipes to choose from on Delia Smith's site Delia Online. I have a tenuous relationship with recipes from England. There was a time (and what a time it was) that I studied in Austria and traveled widely and ... lived on $5 a day. I looked longingly in French restaurants and Austria's pastry shops. And then went to the market and got a baguette, a small piece of cheese and some fruit and that would see me through the day. I knew there was better food to be had. But I was 19, broke and in Europe! I woke up every day saying "I'm in Europe" and food was secondary to the adventure. The only place where food did not beckon was in England. I was sated with Shakespeare's homeland and the history of the Plantagenets and the Tudors. I could shout out a credible history of the reigning families way before there was a TV series. (Yes, I am that much of a nerd.) Walks on English soil fed my Anglophile soul. A simple ploughman's lunch would take care of the rest. For 40 years, Delia Smith has worked to change the perception of English food. Famous for her no-nonsense approach to cooking, she was won numerous awards and gained accolades through her many television shows and cookbooks. As you may have guessed, Delia Smith is #35 on Gourmet's list of women game-changers in food. She left high school at 16 - didn't even bother taking her exams and flitted from job to job. There was the odd year as a hairdresser, and then there the shop assistant year and later work in a travel agency. At age 21, she finally fell into the food world and never looked back. Her influence is huge. If she demonstrated an egg dish on her TV show, eggs disappeared off of grocery stores shelves. Once she caused a shortage of eggs! When she recommends a product - the product sells in a way they never did before - not unlike Oprah's influence. She is almost a corporation in her own right. Take a look at her website for the breadth of her recipes and the products she sells. Legend has it, she finally settled on cooking after her boyfriend told her to go to culinary school because she cooked so well. (These days the boyfriend would be back asking for a percentage of profits because it was his idea!) Whatever you think of her recipes, she struck a chord in England and fulfilled a need before there was a Nigella or a Jamie. Smith does not feature "British cuisine." She looks for decent food - fairly easy and if there's a shortcut - she'll take it. For the Polenta appetizer, she recommended buying the prepared rolls of polenta you find in the produce section. I didn't - but that's me - you certainly can and I wouldn't blink an eye. I made a pot of polenta in the morning, put it in a loaf pan, refrigerated it during the day and then later cut it into rectangles and toasted it. However you choose to do it - it's a soothing appetizer for February. I enjoy a dish that tempts me with creaminess, salt, crunch and a little chew all one plate. It teases with textures and hugs you with flavors. Put the olive oil into a saucer. Cut the polenta into six ½ inch (1 cm) slices and arrange these on the baking sheet, side by side. Brush each piece with olive oil, season generously with salt and freshly milled black pepper. If you're cooking for two they can be joined into threes; if not leave a gap in between each one, then place the baking sheet under the grill about 4 inches (10 cm) below the heat source. Time it for about 3 minutes. Next loosely roll up the pieces of ham and when the 3 minutes is up place a rolled-up piece of ham on top of each polenta slice. Next place a slice of cheese on top of the Parma ham and finally dip the sage leaves into the remaining olive oil and lay on them on top of the cheese. Next loosely roll up the pieces of Parma ham and when the 3 minutes is up place a rolled-up piece of ham on top of each polenta slice. Next place a slice of cheese on top of the Parma ham and finally dip the sage leaves into the remaining olive oil and lay on them on top of the cheese. Place the baking sheet back under the grill and give it another 3-4 minutes or until the cheese is bubbling and turning golden and the sage leaves are crisp. I do think of this as more improvisation than a recipe. Grill or bake some polenta and throw on some toppings. What's not to like? Please check out what the other bloggers are doing for Week 34 of Female Chef Gourmet Game Changers. And if you want to join in the fun, e-mail Mary at One Perfect Bite. Mary started this delectable journey. This February 14th Day (known in some circles as "Single Awareness Day"), we'll be celebrating the orange. I have nothing against chocolate - in fact I am sitting in my kitchen in sweet bliss munching on Bissinger's Dark Chocolate Wine Grapes which counts as one of my fruits for the day. But this Sicilian Orange Tart - sparkles - in aroma and taste. It brightens the kitchen - it lightens winter. True - it emerges from the oven a wee bit homely. Lightly browned - asking for a dusting of confectioner's sugar. Chocolate shavings wouldn't hurt. As winters go - we are a balmy 27 degrees F which is most welcome after two days of 1 degree F.
The only snow is in the back of the yard waiting for longer days of sun. It's coming. But if the days are not long enough, this dessert brings the sun into the kitchen long after our nurturing star has left. The Sicilian Orange Tart is from Giuliano Hazan's Every Night Italian. He promises "a refreshing and aromatic dessert that leaves a clean taste in your mouth. It has received rave reviews whenever I have made it." The orange tart lives up to its press. My February-Minnesota kitchen was an orange grove for a few hours. My daughter was shocked that I was going to let it sit in the fridge over night - telling me I shouldn't tease her with baking aromas. And it was easy - I am a non-baker who likes to estimate and add pinches and fistfuls of stuff - and not rely on things such as measuring spoons. But I followed the recipe and dotted my i's and crossed my t's and was rewarded with a smooth, sublime tart that gave me the warm Sicilian sun. You will need an 11-inch tart pan with a removable bottom. *If you can look past the sugar, this is breakfast. Orange juice and eggs. Check off another fruit for me and protein. 3. Remove dough from processor (carefully!) and place it on the removable bottom of the tart pan. (Note: Next time I will spray the tart pan a bit.) Using a rolling pin, roll dough until the dough is 1/4 inch thick - allowing the dough to extend over the edges. Carefully slide the removable bottom off the edge and lift it into the tart pan. Press the dough against the sides of the pan and trim any overhang. 4. Cover the dough with aluminum foil and weight it down with rice or dried beans (or pie weights!). Bake for ten minutes. Remove foil and weights and bake for another ten minutes. 5. While crust is baking, juice your oranges. Put eggs and sugar in the bowl of a mixer and beat at high speed until pale, yellow ribbons form - 2-3 minutes. Reduce speed to low and pour in your orange juice beating for 30 seconds to 1 minute. And if your heart is set on chocolate for Single Awareness ... make that Valentine's Day, remember that President's Day is a good day for a tart... and Carnevale... and Leap-Year-Day... and you really don't need an excuse to make a tart. Everything should be celebrated, right? Surprise someone and make it "just because." But - do make it. When I was a young teen, my parents had their very first flush of expendable income. Once a year, they would pack my sister and I up, drop us off at Aunt Roses's and take a cheap flight to New Orleans, stay in a cheap motel and proceed to listen to jazz and dine like kings. Their last stop before the flight home was always Brennan's for brunch. They came home with matches from Brennan's and Mardi Gras trinkets which my sister and I treasured. "Well, why don't you come along and help me with it?" And so she did. And the rest is history. Ella Brennan is now known as "The Queen of New Orleans cuisine." Sixty-four years later, her family owns a dozen New Orleans restaurant and Ella Brennan is the matriarch. Just as she did decades ago, Brennan continues to be the student and teacher and puts in regular appearances at her restaurants. She believes in developing local, American cuisine and providing exemplary service - the perfect restaurateur. Read more about this depression baby's climb up the culinary ladder here. I chose Ella Brennan's Trout with Pecans Ella Brennan developed the recipe with Chef Paul Prudhomme. It was their answer to trout amondine that had currently swept the culinary world. They thought - almonds? What about pecans? There's a forest of pecan trees in the south! A version of this is still on the menu at Brennan's Commander Palace. In the end, I couldn't do it all - there was just too much butter. I am living with "He-who-is-on-the-first-diet-of-his-life" and is miserable! So I am trying to ease him into dinner time. I did one trout fillet the "Ella Brennan" way and another trout fillet the "Italian way." See which one you like - they offer different sides of the coin - but combine to be on the money. I am giving you the entire recipe - but I skipped the sauce. Sauteing the fish in butter and then spreading pecan butter on top of the warm fish was enough butter for me! But as you will see below - you are supposed to saute in butter, spread pecan butter over the fish and then top with the sauce. Oh my! 1. Pecan butter: Place all pecan butter ingredients into the container of a food processor or blender. Cover and process to a smooth puree. Set aside. 2. Sauce: In a small bowl, combine flour and 2 Tbs. water to make a smooth paste. In a small saucepan, bring stock, Worcestershire sauce, and lemon juice to a light boil. 3. Whisk about 1/3 cup of the hot stock mixture into the flour paste. Then gradually pour the flour mixture back into the saucepan, stirring constantly with the whisk, and bring to a boil. Whisk in the softened butter, a tablespoon at a time. Keep sauce warm. 4. To prepare the fish, blend the Creole seasoning and salt into the flour in a wide bowl. Beat the eggs with the milk in a second wide bowl. 5. Dust the trout lightly with the seasoned flour. Pass it through the egg wash, and then dredge it through the seasoned flour. 6. In a large skillet, heat half of the clarified butter over medium-high heat until a sprinkling of flour sizzles in it. Add three fillets of trout and sate three or four minutes, until golden brown, turning once. Transfer fillets to serving platter and keep warm. Add the rest of the butter to the pan and sate the remaining trout. 7. Spread pecan butter over trout, sprinkle with roasted pecans, and top with the sauce. I won't lie to you - even without the rich buttery sauce this was absolutely delicious. Sated, sweet sighs at the dinner table told me so. The pecans caramelized a bit during the saute and nobody ever said a butter sauce didn't tantalize. It's wonderfully wicked. For each trout fillet, whisk 1 tablespoon extra-virgin olive oil with 1 tablespoon fresh lemon juice. Add: 1-2 tablespoons of fresh thyme, or oregano or basil or parsley or a combination of your favorite fresh herbs or 1 teaspoon dried Italian seasoning. Salt and pepper to taste. Bake at 350 degrees F until done - 5-10 minutes depending on the thickness of the trout.) If I was thinking, I would have thrown some roasted, chopped hazelnuts on top. A word about pecans: in days of yore, I did summer stock in Flat Rock, North Carolina. I met a friend who later stayed with me in my tiny NYC apartment. As a thank-you - she sent me a huge box of fresh pecans - just picked from her tree. I brought them to my family and we wondered what to do with all those pecans. In the end, we simply ate them over the course of one weekend. I had never had a pecan that didn't come in a package and the fresh nutmeats were a welcome revelation. I can still remember my fingers and toes waking up to each rich bite. A word about diets: Years ago, my cousin and her husband went on a diet together. She went to Weight Watchers and he gave up his daily Dove Bar. Guess who lost more weight? Please check out what the other bloggers are doing for Week 33 of Female Chef Gourmet Game Changers. And if you want to join in the fun, e-mail Mary at One Perfect Bite. Mary started this delectable journey. Expect the unexpected. It's the sweet juice in life. Sometimes you think it's a curve ball and you duck but when you come up - if you're lucky - you just may find something new to enchant. And during those moments - you never grow old. We found a legion of Roman soldiers in Bologna. And insights as to how they lived. And Ragu Bolognese in every city we visited. You don't need to go to Bologna to have a terrific plate of ragu. And even if an ocean is standing in the way of you and Italy - this recipe will fly you there - as surely as you grabbed the tail end of a kite and soared there yourself. This is a particularly earthy version. The porcini mushrooms just thrust you into the Italian countryside where you think yourself the mighty forager. It's hearty, meaty and substantial. Perfect for a snow day. Especially when the snow day is unexpectedly in Rome! Soak the mushrooms in hot beef broth for 30 minutes. Heat the butter in a large skillet of medium heat. Add onion and cook for 3-4 minutes. Add sausage and cook until no longer pink and you have made it all crumbly with the back of your spoon. (6-10 minutes). Somewhere during the simmering process cook the fettuccine according to package instructions. Stir in the nutmeg and milk and cook over a low heat for 10 minutes. (I use freshly- grated nutmeg but the spice police won't pick you up if you don't). Salt and pepper to taste. Mix with fettuccine and serve, passing Parmesan separately. And note - this is a ragu - not a liquidy tomato sauce - don't drown the pasta! Let the ragu mix with the pasta - not overpower it. At the Piazza Navona in Rome, we came across a gentleman singing karaoke to Pavarotti. Tears streaming down his face as he sang, he wound up being one of our fondest memories. We returned again and again looking for him. And even though I a have been home for months, the unexpected still sneaks up on me. On Saturday morning, the Twin Cities was paid a visit by the Frost Fairy. Last winter, we lived on a frozen tundra. This winter we dwell with the frost fairies. I wasn't sure. Roasted red peppers with mint? And currants? Where was the garlic? The basil? The savory mixture I grew up eating? But I made it as written. My mother was sure. "This tastes just like Grandma's." And so I tasted it. And was finally sure. It was lovely. The Roasted Red Pepper Salad comes from Christopher Hirscheimer and Melissa Hamilton's Canal House Cooking cookbook. The two women are number 33 on Gourmet's list of 50 Women Game Changers in Food. Hamilton is a former editor of Saveur and cut her cooking chops with a restaurant in New Jersey as well as at Martha Stewart's Living and Cook's Illustrated. Christopher Hirschmeimer was one of the founder's of Saveur. But her work at Metropolitan Home Magazine is what brought her to acclaim. Hirscheimer is widely credited for changing the face of food photography. She added the artfully messy contrivances to the photos - letting go of the former "helmet hair" mentality that stalked the photos for decades. The two women had been friends for years and as many do, grew tired of the commuting/corporate world and -co-founded Canal House as a photo/design studio for food. That soon branched out into cookbooks - 3 volumes a year of 75 seasonal recipes. "Canal House cooking is home cooking by home cooks for home cooks," is their mantra. Read more about the two women here. Roasted red peppers in February? Is that seasonal? Well - sort of. If you roasted bushels of them back in September and then froze them for use all year round! All right - I get a "D" for seasonal cooking here. But an "A" for good taste! Roast your peppers. Cut into long lengths. If you've never roasted peppers, follow the link at Ciao Chow Linda's blog. Whisk lemon juice and olive oil. Add currants (raisins) and capers. Add roasted peppers and turn to cover them. Add mint and salt and pepper to taste. Marinate at least 1 hour before serving. I do love bringing color to the table. Come February, I am starved for reds and yellows. And a little green. I am coming to NYC with daughter the last week in March. It's been four years since I visited my little hometown. My baby cousins are full-fledged children and Eataly awaits! In early March I will be in Utah with Under a Midsummer Moon and the end of March - in NYC. I clearly don't have the hang of going to warmer climes in the winter! Please check out what the other bloggers are doing for Week 32 of Female Chef Gourmet Game Changers. And if you want to join in the fun, e-mail Mary at One Perfect Bite. Mary started this delectable journey.